info about mystery tomy set? could you give me some info about this set please? Also, since the red cheeked error Pikachu seems to be a popular card, I'll mention that I have 3 more (one was sold) double of that. I was going to be ordering a Japanese (it's only available in Japan) Zekrom Strength Deck, but shipping ended up being higher than anticipated. It's going to cost me about $30shipped and I only really want 12 cards from it. So, I was wondering if anyone would be willing to split the deck/cost with me? Still doing Jumbo card pickups sometime next week - Info here Everything else in the journal still stands as well - card trades and looking for old version of Pichu charm. (speaking of wants...also looking for Glaceon and Houndour tomys and Houndour and Shadow Lugia Pokedolls). P.S. I know I have been posting a lot recently. This should be my last post for awhile...unless I decide to update about the Jumbo card pickups when that happens. Seeking Glameow Plush, and a Mystery! 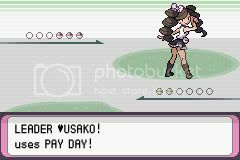 I'm looking for the Pokedoll, Banpresto Halloween plush, or the Jakks plush as a last resort. I'm willing to pay up to $20 before shipping to Canada. Additionally, does anyone know anything about this Glameow plush? While searching the Glameow tag, I saw a member post this picture, but unfortunately they didn't provide any information on it. (They are no longer active.) 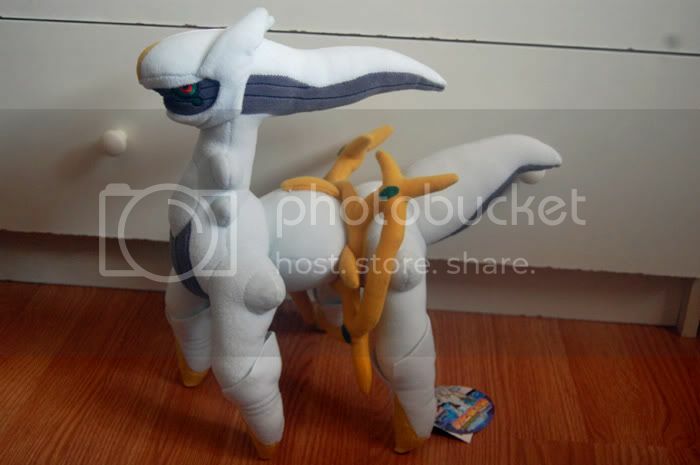 I didn't see this plush listed under the Pokeplush Project either, and it's so cute! Is it official? Who made it? Where can I get one?! I need to know! Amber also checked the Pokeplush Project, but since this isn't listed here I'm sure she doesn't know about it, and I think it would be an awesome surprise for her. XD I'm personally not a fan of Glameow, but I'm getting really into this for my friend. Thanks for the help! - Pachirirsu and Emonga Pan Stickers~! Hi, it's Juuchan again! Well, this is a bit of a collection update [I'm expecting some new items any day now! ], as well as a couple of curious questions to the comm about a certain type of merchandise that I've gotten an interest in for a while - Party favors! 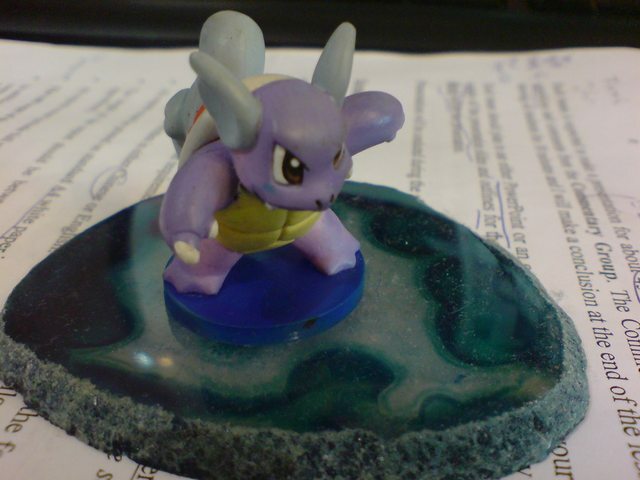 I know that in the US, there have been some party favors/birthday supplies & decorations made for fans of the Pokemon franchise - most recently for the Diamond & Pearl anime/Gen IV series, though I now see some for BW online - but does anyone have any, either recent or from back in the day? Same goes for other countries too - I'm curious to know if they're available around the world or just in the US. Balloons, party games, cards, decor, pinatas, anything goes~ I'll even accept fan-made things here [only if they were used for a party, mind you]; pictures or links would be nice to see too! Here's some that I have collected - it's not much, but it's still something - and now, there's some pictures! Price check in isle 7 please! Hey all, hope everyone's vacation time has been awesome and holiday have been fun! Thank for any info you can give me! Also, looking for any Wailord, Joltik, or odd Gengar items. I'm running out of room to keep these large plushes, so I'm looking to auction them at low starting price. I was wondering if anyone would be interested in buying the 2 extra DX tomy figures in this lot (Eevee and Heatran). They are 18.00 each (after paypal fees) and shipping costs are only from me to you (approximately $5 within US, $7 for international). Sales permission granted 18 Aug 2011 by denkimouse. Hey, everyone! I'm a new member, but long time lurker. I really love your community and I'm glad that I'm a part of it now! I collect Mew stuff, and although my collection has a lot of growing to do, I'm sure it'll get there! Is there such thing as 6" mareep plushies? Excited for Anime Zap tonight!! anime convention in Illinois! New 'Pokemon with You' Badges! There is a Mew, Celebi, Shaymin Land Form, Manaphy, and Jirachi! If you are willing to part with your Umbreon please reply to this post asap!!! Thank you. Today, my boyfriend and I received our first package of bought stuff from another member of the community! So if you are going to bid PLEASE be prepared to PAY ON the 16th so I can ship on the 17th. Auctions END Jan 15th at 23:50 (that's 11:50 PM PST). ~Everything is in USD, shipping is not included. ~All pictures are taken by me, WHAT YOU SEE IS WHAT YOU GET! ~Backing out of a purchase or bid WILL result in negative feedback. Over the past few weeks I've gotten so much awesome stuff, it would be remiss for me to not post about it! There's so much, I can't help but feel like I've forgotten to include a few things, but this certainly contains the bulk of it- most importantly, my newest collection! I've also decided to finally part with my TOMY Lucario plush! I dearly love him but haven't had a place to display him so he's been sitting on a shelf in my closet, and I decided it's time for me to find him a home that will appreciate him better. ;-; Because I'm unsure of his actual value, he's up for offers! I've put off getting one of these guys for too long now. I'm looking to get one for around $20 shipped if possible. Hopefully one of you have one for sale or one that you are willing to let go. Did they ever make these? I have been waiting impatiently haha. 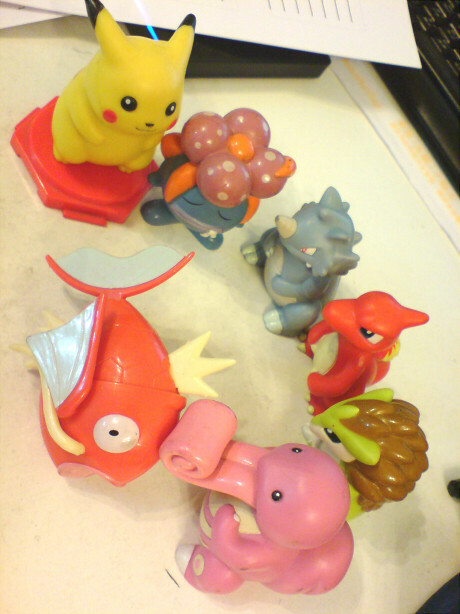 share some kitchenware I have related to pokemon. Also a little update with my Snivys. Does anyone have one of these that they're willing to part with? Another plush I'm looking for is the 1:1 Scale Talking Tomy Mew! Teensy weensy collection/info on a Palkia? Didn't post a picture of my admittedly tiny collection with my introductory post, so I thought I'd throw one here now! Also - I have a bit of a lazy question for anyone who's far more experienced with figures and such! Just a Few Gets I Got. So I went to ALA (Anime LA) for the first time and did not know what to expect. But I am glad I went. That's pretty much it. Thank you! wants, sales and pick ups? Really small wants and price check! I just won an auction for this 7/11 lottery prize Pikachu with mini Victini from eBay, and I was wondering about the Victini from this same lottery if someone is selling theirs? Picture borrowed from this site! So I am on the lookout for the Victini in the pic above, but I am always on the lookout for Victini merch, so let me know if you have something 'Tini related for sale! Also, I was wondering about how much do these lottery plush normally go for? I got mine for what I thought was a decent price(I was the only bidder), but I really have no idea if it was a good price or not! Collection update for the new year. Hi everyone! Just wanted to share some of my recent gets with the community. I hope you enjoy them. Psst. 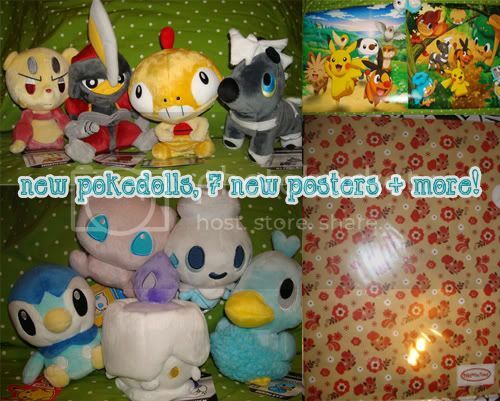 Have a question.. found a listing for three pokeplush. I was hoping someone could tell me if they were bootleg or not, since the starting price is about $20. If they're authentic, what d'you recommend my max bid be? I hate my computer chair. D: So I'm saving up for a better one! P.S. I'm not much for trading at the moment, but I am interested in a Scraggy related item of some sort. A plush would be nice, but the ideal is a useful item like a clear file. No figurines or cards, please. And a small update for shipping status: to everyone who have brought from my shop recently, and had their payment send yesterday: I've shipped your items today!